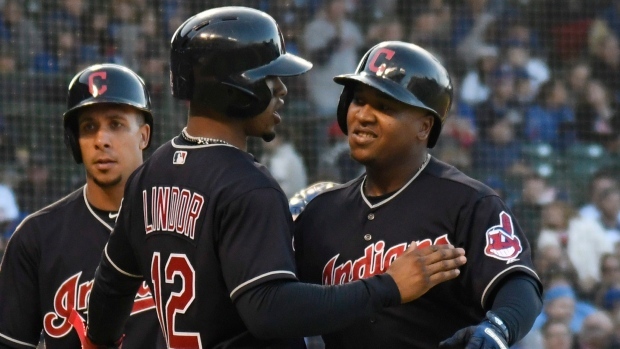 CHICAGO — Jose Ramirez turned on a knee-high pitch and launched the Indians toward a lopsided victory. "He's one of the better hitters in the game," Cleveland manager Terry Francona said. "You look at him (5-foot-9, 165 pounds) and I don't know if you necessarily think you see a guy who can drive the ball out of the ballpark like that. And now as he's accumulating some experience, he knows the pitchers, he knows how they're attacking him. It makes him even better." Yonder Alonso had three of Cleveland's 11 hits, including a three-run double in the fifth to make it 10-0. Chicago manager Joe Maddon said Chatwood has a "busy delivery" that the Cubs need to "harness." "If you watch his delivery closely, there's a lot going on," Maddon said. "That tends to lead to lack of command of the fastball, and he's not the only guy. There are other pitchers that are like that, too." Three of Chatwood's walks came in the third, bringing his major league-leading total to 40, and the crowd of 37,168 let him hear it. Chicago was 0 for 10 with runners in scoring position and left 11 on base. The Cubs didn't score until Ian Happ led off the ninth with a pinch-hit homer against Josh Tomlin. Bauer lashed out at posters on Twitter for linking a message he inscribed in the dirt behind the mound — "BD 911" — to the Sept. 11, 2001 attacks. Bauer said it was "completely unrelated." He said it was a "personal thing" involving a "close friend" and their training together. "For people to take it a step further is just ridiculous," Bauer added. "It's a tragic day in our country's history and it's just senseless and that's all there is to it. Shame on the people saying that. It's completely unrelated." Indians: Francona said "all reports are good" on OF Lonnie Chisenhall (strained right calf) after he had two hits for Triple-A Columbus on Monday. Chisenhall has been sidelined since April 7. ... Francona said OF Bradley Zimmer (bruised left rib) could be ready to play by the weekend, whether he returns from the disabled list or goes on a rehab assignment.